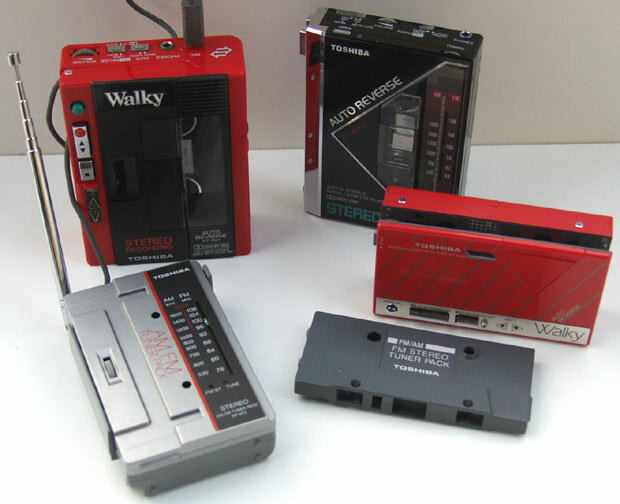 Electronics giant Toshiba (originally known as Tokyo Shibaura) announced their stereo Walky shortly after Sony’s release of the original TPS-L2 Walkman. 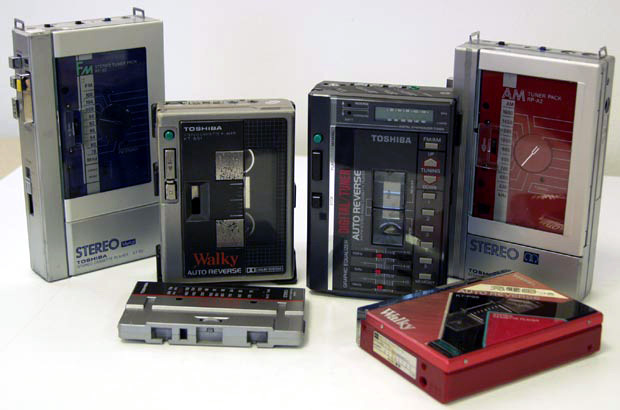 The stereo Walky surpassed the offerings of the Walkman by its unique radio built into a cassette shaped case. One could pop this radio module into their Walky to catch FM or remove it to play cassettes. The gimmick lasted a few years until competing models arrived with built-in AM/FM tuning. In 1986, Toshiba offered the first personal stereos with digital tuning (the same year they introduced the world’s first laptop computer). l-r: TP-RS1 External Module with RP-AF2 AM/FM Tuner Pack; KT-RS1; KT-4076; KT-AS10 with RP-AF5 FM Stereo Tuner Pack. l-r: ’80s US, Japan and Canada & Toshiba portable stereo catalogs. This entry was posted in Toshiba by pocketcalculatorshow. Bookmark the permalink. Toshiba AM/FM Stereo cassette player model KT-A930 made in China. The darn thing still works and sounds very good. The only thing that is wrong with it is the cover that holds the cassette is missing one of its hinge pins, (a plastic part that has broken). Do you know of any parts that may be available to replace the broken pin?